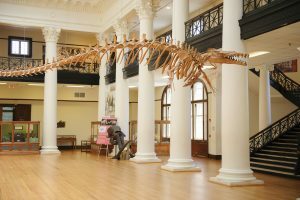 The Alabama Museum of Natural History in Smith Hall is one of five UA museums participating in the Blue Star Museums program. TUSCALOOSA, Ala. — Active duty military members and their families can enter University of Alabama museums free of charge beginning Monday, May 28 as part of their Blue Star Museums program. The Blue Star Museums program is a partnership between the National Endowment for the Arts, Blue Star Families, the Department of Defense and more than 2,000 museums across America. The program will begin its ninth year and will run from Memorial Day through Labor Day (Sept. 3). Active duty military and their families will receive free admission to the Alabama Museum of Natural History, Moundville Archaeological Park and Gorgas House. Admission to the Warner Transportation Museum is regularly free, so Blue Star families can take guided tours for just $1 per person. UA Museums are participating in the program for the first year. “Most of us personally know Blue Star Families,” said Dr. Bill Bomar, executive director of University of Alabama Museums. “One of my favorite Blue Star Families happens to be descended from former UA President Josiah Gorgas and his wife, Amelia, whose lives are commemorated at our Gorgas House Museum. The Bryant Museum is participating in the Blue Star Museums program for the seventh year. In 2017, 746 community members took advantage of the Blue Star program at Bryant Museum. For more information about Blue Star Museums programs, visit https://www.arts.gov/national/blue-star-museums.